Can you feel that? March Madness is upon us once again; the NCAA Tournament is here! We’re almost to the season when we’re glued to our phones, tracking our picks, and weeping as we realize that no, this is not the year a 16 seed finally beats a 1 seed. It seemed like such a good idea at the time. It’s the time of year where everyone, even those who don’t care usually about college basketball, fill out a NCAA Tournament bracket. 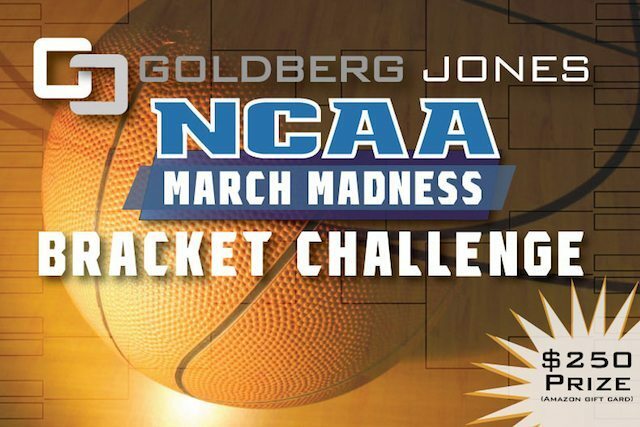 If you’re looking to get into a pool, check out Goldberg Jones’ NCAA MARCH MADNESS BRACKET CHALLENGE. Not only does the winner get bragging rights, you also walk away with a $250 Amazon gift card. For the uninitiated, the way the NCAA Tournament is structured is this. 64 teams (actually, it’s 68, as there are four “play-in” games earlier in the week) are broken up into four regions: East, West, North, and South. In each region, teams are seeded from 1 to 16, with 1 being the best and 16 being the weakest. The highest seeds play the lowest. For example, 1 plays 16, 2 plays 15, and so on until we get to 8 versus 9. Each round of the NCAA Tournament has a fun alliterative name, like the Sweet Sixteen, Elite Eight, and Final Four. In order to win the national championship, a team must ultimately win six consecutive games. Filling out a NCAA Tournament bracket is practically an American tradition, but it can also be overwhelming. With that in mind, here are some tips, tricks, and other counsel to consider while picking your teams. Take everything you’re about to read with a grain of salt. Even if you consume an absurd amount of basketball—from the blue bloods like Duke, Michigan, and Kentucky to the little guys like the University of New Orleans, East Tennessee State, and Bucknell—this is a harrowing endeavor. You can read everything Joe Lunardi writes, know who’s hot, know which team’s hot streak is on the wane, know who’s underachieving and due for a run, and expended all their energy in their conference tournament, but still have no idea who will emerge from March Madness victorious. How many people who win pools don’t watch a single game and picks based on mascot preference or uniform color scheme? There’s (almost) always a 12/5 upset. There’s a reason this is the fan-favorite upset pick. Since the tournament field expanded to 64 in 1985, a 12 seed has upset a 5 seed in all but two years (2015 and 2007). In four seasons (2002, 2009, 2013, and 2014), three of four 12 seeds won. Odds are that it will happen at least once in 2017. Unexpected upsets are good for you as it sets your bracket apart from the rest of your pool. It may be high risk, but going with an unconventional choice may also be high reward. Is this the year a 16 seed beats a 1 seed? No. It will probably happen eventually, but a 16 seed has yet to beat a number 1. As much as we want to see the University of New Orleans topple Villanova, or Texas Southern upend North Carolina, it’s not a good bet. However, a 15 seed has taken down a 2 seed eight times, including Middle Tennessee over Michigan State last season. What does a conference championship mean? Winning a conference tournament gives a team an automatic bid to the Big Dance, but that doesn’t always mean continued NCAA Tournament success. The last three national champions didn’t win their conference tournament. Playing games one day after another is exhausting and takes a ton of energy. And when a team is playing for its tournament life, sometimes they use so much gas they don’t have much left to make a run in the NCAA. Cinderella has a curfew. One of the greatest joys of March Madness is watching the underdog take down the big boys. We all fell in love with Florida Gulf Coast in 2013. And who can forget watching scrappy 11-seed George Washington’s magical Final Four run in 2006? But eventually the clock hits midnight and Cinderella’s carriage turns back into a pumpkin. The lowest seeded team to ever win it all was Villanova as an 8 seed in 1985. In the last 15 years, every NCAA Tournament champion except Connecticut in 2014 (as a 7 seed) has been a 1, 2, or 3 seed. Only one 15 seed has ever been to the Sweet Sixteen (FGCU in 2013). Upset special. Since we all love an upset, it’s good to know where they usually happen. 76% of upsets are by a 10, 11, or 12 seed. 12 seeds alone account for 27% of all NCAA Tournament upsets, which is why the 12/5 upset is such a popular pick. Take these numbers into consideration when making your March Madness picks and looking for a surprise choice. where is the link to the game? Not running a bracket challenge this year.